The nature of drainage systems means they are subject to a host of issues which can cause them to malfunction. After all, they are often underground and subject to an array of elements and weathering effects. We can split problems with drain pipes into three main categories; blockages, collapses, and cracks. In this blog, we will outline the difference between these and shed some light on what we might do to fix them. As debris builds up in your drainage systems, clogs will begin to accumulate. As they grow, water flow will become increasingly restricted. Eventually, this will cause an outright blockage which means no water at all will be able to pass. These types of clogs will cause significant water damage. As the water backs up, so will pressure, which can lead to burst pipes and extensive water damage. The liquid, with nowhere to go, will force itself through gaps and cracks, eventually causing a full-on flood. In order to fix a burst pipe, we typically use our high-pressure water jets to fix the problem. We will find remote access to your system and blast incredibly high-pressure water through your pipes which will force blockages to break up and flow along. Blocked pipes generally give off foul odours as debris decomposes within the system and bacteria accumulates. If flushing or draining water starts making loud gurgling noises, then there is a good chance of a blockage. The sounds come from the water trying to bubble past the obstruction. If your sink begins to empty significantly slower, then this is a sign of a clog. The explanation for this is simple: the water simply cannot get where it needs to go. 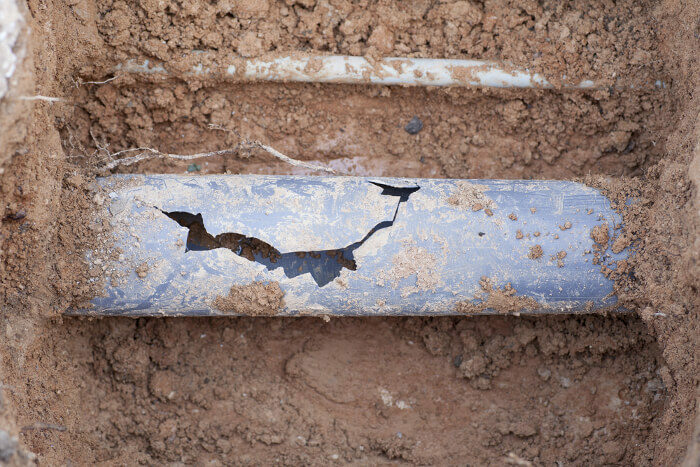 While blockages are a problem inside the pipe, a crack is an issue with the pipe itself. They can occur for a vast number of reasons. Pipes which are outside, for example, are exposed to a number of challenges even when they are underground. Changing temperatures can cause pipes to crack, or any digging and movements in the earth nearby. Occasionally, the plastic will simply become too old and worn out, sprouting small fissures across the surface. Another problem with cracks is that they can quickly expand. One way that this happens is the issue of troublesome tree roots. Trees and plants will grow towards sources of moisture, finding a tremendous source of liquid within drain pipes. The roots will naturally find the cracks and will grow inside, eventually forcing them to widen and causing slight cracks to become wide gaps. 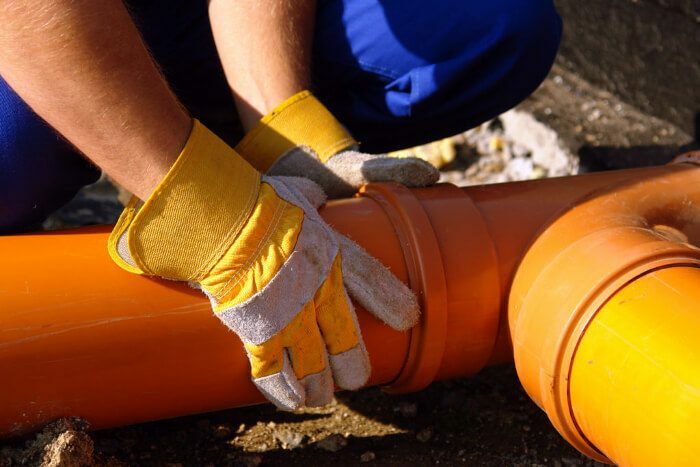 To fix a cracked pipe, we will generally locate the problem and undertake excavation. Once we have exposed the pipe, we can remove it and replace the broken section altogether. Due to the fact we are targeting a particular location, despite the excavation disruption will be kept to a minimum. A collapsed pipe is one of the most damaging problems that can occur within your drainage system. Rather than water escaping slowly, such as in the event of a crack, water will flood out of the destroyed pipe. If this happens inside your home, water damage will be widespread, and you will need to book in our swift emergency repair service. More likely, however, is that the collapsed pipe will occur outside of your home. This can very quickly lead to your garden becoming entirely waterlogged, leading to expensive landscaping work on top of the drainage repairs. In order to fix a collapsed drain, there is no alternative to locating the broken section and replacing it entirely. Again, this will demand excavation work. However, by narrowing the problem down to the precise location of the collapse, disruption will be kept to an absolute minimum. The giveaways for a collapsed drain are in many ways similar to a blocked drain, but there are also many more. For example, when the pipe collapses and the surrounding earth becomes flooded it will begin to sink and collapse. When this happens, you will likely notice a significant dip or crevice in the ground outside. If you are dealing with a blockage, crack, or collapse, it is vital that you get in touch with us as quickly as possible. Although there is no doubt that we will be able to immediately rectify the problem, the longer the problem persists, the higher the chance of extensive water damage. Our technicians are available 24 hours a day each and every day of the year. No matter what issue you are facing, reparations can be organised with a simple phone call. To make an inquiry about our service or book in a job today, give us a call now on 0808 164 0776. Alternatively, fill in our contact form, and one of our advisers will be in touch as quickly as possible.